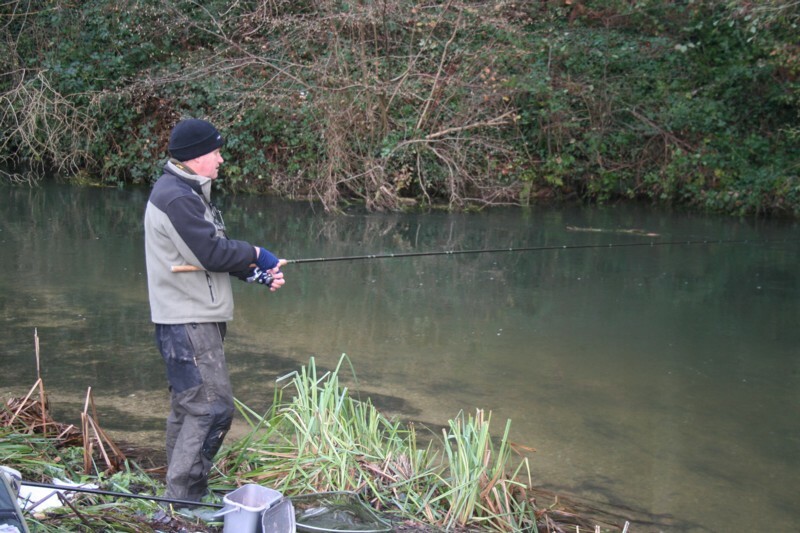 Steve Innes of the Tench Fishers has set up the normal trip to the Itchen fishing for grayling. Slowly as the date drew nearer people dropped out due to work commitments and the bad weather forecast. There was some snow fall there the previous week and the signs were not good. I set off from home at 6.15am on a very cold and frosty morning the temp was showing -5c on the car. The drive of just under 80 miles was terrible but who cares when fishing is the end game. I arrived at about 8.15am and drove up the gravel path, well I say gravel it was snow and ice covered and with the river just inches away it concentrated the mind. I found the two other mad Tench fishers Mick and Steve already fishing, and both blanking, not so good! The temperature was very cold Steve said that the rod rings were freezing with river ice. Slowly I tackled up and chatted to the Fishery bailiff for a bout 30 minutes about practically most things on the river. 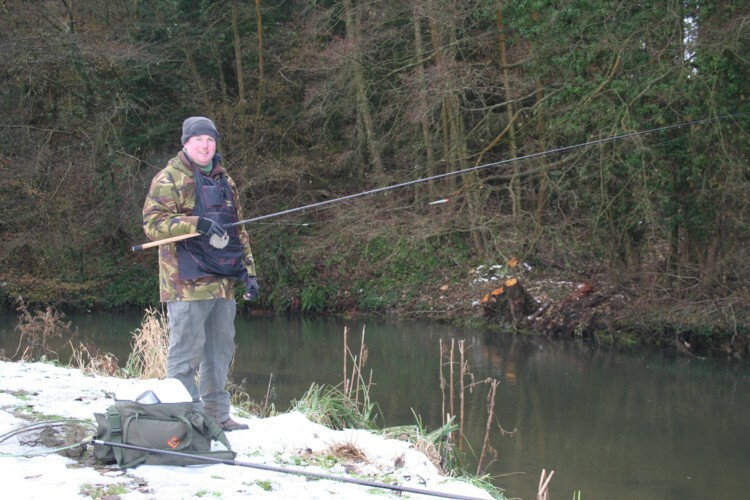 I fancied going to the top end of the coarse fishing stretch and working my way downstream. I was using a size 22 hook tied to 2lb hooklink and 3.5lbs main line. I was going to be trotting for most of the day so red maggots (3 pints) would be my loose feed and two impelled on the hook looked the business. My first swim was a 2ft steady run close to my bank and yielded about 6 fish. the river was clear and there was little snow melt to speak of. 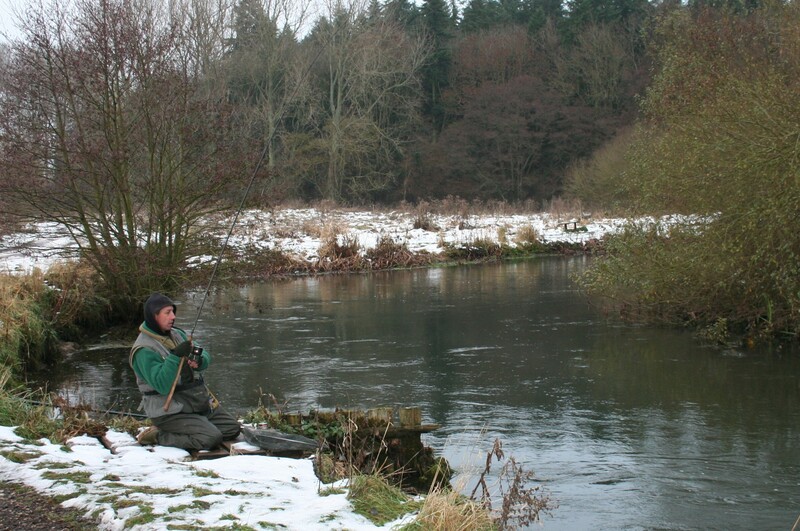 I slowly made my way downstream to the hut where the cars were parked I caught a few fish from each swim I fished. Feeding a few maggots and trotting the float down worked a treat. 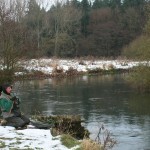 Ice formed in the rod rings that prohibited the line from flowing off the reel a good few times but it was a joy to be out. It seemed that in each swim there was a robin waiting to be fed. I’m sure it was just the one following me downstream. 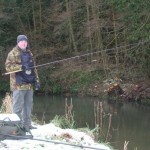 Steve and Mick were both catching too which warmed us all up. 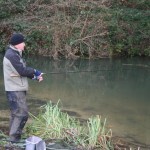 Steve was using sweetcorn at times and was catching just as well. I moved over a large section of the river and caught in every swim. In one swim I even managed a salmon of about 4-5lbs. This gave me a good song and dance on the light line and rod, but it was landed. Poor Mick hooked one and got it to the net, but the net was not big enough and one final lunge took it to freedom. 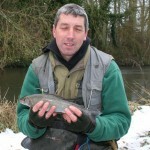 Steve had a grayling took by a pike, poor grayling. Finally it got so cold that we couldn’t get the line to flow through the rod rings. 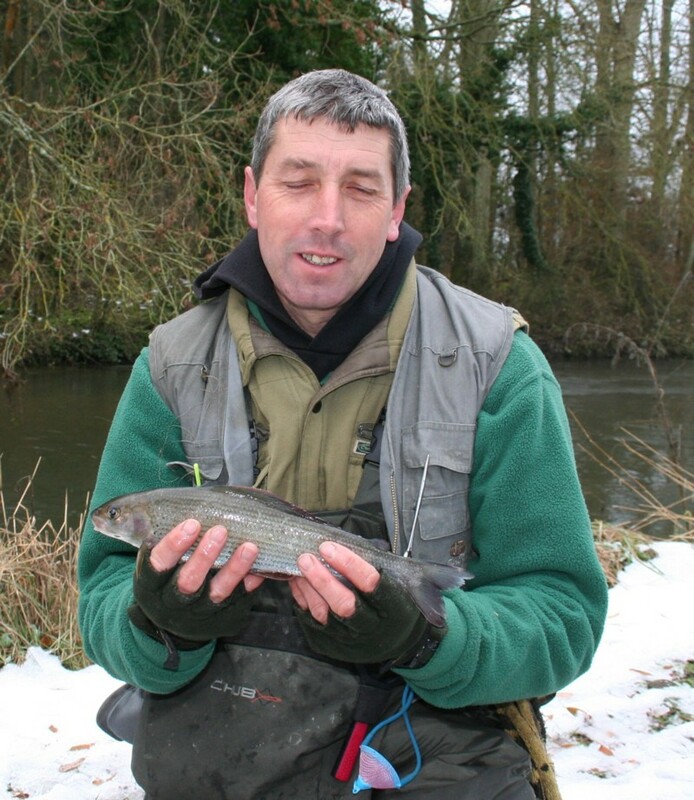 We bullied Steve into using a feeder rod for 30 minutes or so that it was light enough……………he was very good at maggot drowning. The problem with this time of year is the very short days. It was a wonderful cold day but I finished with 49 grayling most between 8-12oz with the largest just under the 1lb mark. This entry was posted on Tuesday, December 7th, 2010 at 8:31 pm	and is filed under Uncategorized. You can follow any responses to this entry through the RSS 2.0 feed. Both comments and pings are currently closed.